Prague-born David Popper achieved eminence early. He was still in his teens when he performed with the Gewandhaus Orchestra in Leipzig and it was at Hans von Bülow's suggestion that he was appointed the solo cellist of the Vienna Court Opera in 1868. As with many leading soloists of the time he also composed and it was during this prestigious engagement in Vienna that he wrote his first Concerto, Op.8. 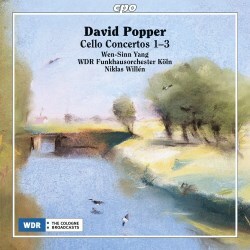 Rather like his distinguished colleague the violinist Henri Vieuxtemps, who a decade later wrote his own first Cello Concerto, Popper impatiently pitches the cello immediately into the fray. Richard Eckstein's booklet notes are commendably honest about this concerto's occasional limitations - gaucheries of construction for one - and about the profusion of material which never quite manages to develop ideally. Popper's concern here seems to be to alternate lyrical material with contrasting scampering passagework. Clearly in the hands of a ripe nineteenth-century player the tension generated between legato lyricism and technical virtuosity would have been sufficient, but even with the best possible advocacy - such as it receives here from Wen-Sinn Yang - little can be done to minimise such flaws. Yet the slow movement, rather Schumannesque, is attractive with some nice wind writing and the finale is even better. Unbuttoned and unfettered by the need to live up to a technical reputation Popper leads us back to Bohemia. There is some surprisingly proto-Dvořákian material and some rich rustic passages. This is a concerto that gets better and better as it goes on, so don't be disheartened if you feel the opening something of a disappointment. By 1880 he was writing music significantly more sophisticated than he had in his mid-twenties. Phrases in the Concerto of 1880 have more breadth than before, where they tended to be somewhat foursquare. An enthusiasm for Wagner seems to have entered Popper's musical thinking, as well as an increased mastery of orchestration. Technical virtuosity is subsumed in the body of the musical argument, not knowingly used as an end in itself. Passagework is deft and there's a real vocalised quality to the melodic writing. With a richly textured slow movement, the music emerges as a kind of aria-reverie, commendably demonstrated by the excellent Yang and his sympathetic collaborator Niklas Willén who directs the WDR Orchestra Cologne. Despite a few, perhaps forgivable technical excursions - the nineteenth-century cellist was allowed to mark his accomplishment here - the finale is fresh, confident and surges with a March theme that enlivens and thrills. The Third Concerto followed in 1888 and what a difference we encounter. It's only ten or so minutes long, cast in a single movement, and written for a smaller orchestra than is the case with No.2. Supposedly written for a private event, this is a much more essentially lyrical work than its companions, being largely shorn of extraneous gestures. The lyric moments themselves are delicious. There is a touch of percussion overload in the tuttis in this performance. Antonio Meneses has recorded No.2, coupled with the famous Op. 50 Suite, for Pan Classics, a disc I've yet to hear but in presenting all three concertos on the one disc, Yang is staking a central place in the discography of these works. Originally broadcast by WDR, these fine studio tapes, with the cello spectrum quite forwardly balanced, offer still unusual fare in excellent performances.